Wild and untamed, Utsjoki is the second most northerly village in the EU; here reindeer outnumber humans by a significant margin. Utsjoki is a remote wilderness synonymous with the image of Lapland. As the most northerly municipality in Finland, the region is sparsely populated with only 0.25 inhabitants per square kilometre. Beyond this is a rugged and wild wilderness which spends six months of the year under the cover of snow. The variation of idyllic woodlands, snowy fells and sweeping skies make for a truly magical destination in which to witness the Northern Lights. The remote location is reflected in the pace of the daily life of the locals which is slow and relaxed. Very little has changed over the ages meaning that the main sources of employment and income remain reindeer husbandry, recreational salmon fishing and tourism. The proximity to the Norwegian border and the unique cultural and scenic surroundings draw tourists from Europe and beyond. The indigenous Sámi population remains strong in Utsjoki and their culture is highly evident throughout the municipality. The area itself has been inhabited since the final stages of the last Ice Age with dwellings discovered dating back over 9,500 years. There is a very strong sense of history and tradition in the Utsjoki municipality and many old ways are carefully guarded and preserved. The genuine, living Sámi culture can be seen every day. The cultural and social traditions of the Sámi, which stem from their unique historical stages, add a fine element to everyday life in this remote region. Sámi culture is so entwined with this landscape, that three of the fells surrounding Utsjoki are considered to be "AIligas" which in Sámi means "Sacred Place." 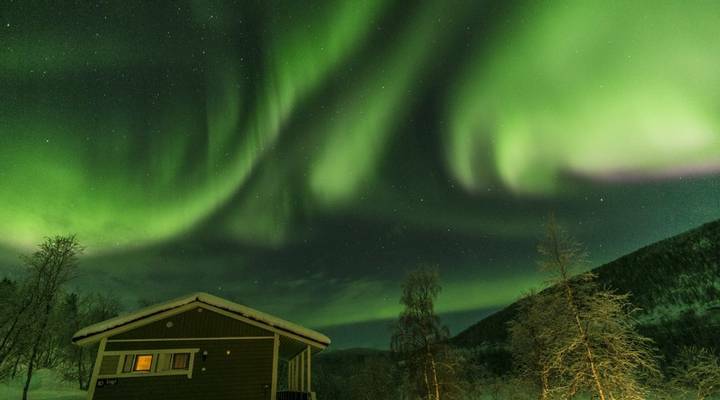 Standing amidst the huge snow-swept wilderness, surrounded by the undulating fells and listening to nothing but the sounds of Mother Nature whilst the Northern Lights dance overhead; it is not hard to understand why the Sámi people attach such spiritual significance to the Utsjoki municipality. Our accommodation is situated about one kilometre outside the small town of Utsjoki and overlooks the beautiful Teno River and across to the Norwegian fells. Cross the Teno River when it is frozen and you are in Norway. The accommodation is owned by a local reindeer herding family, offering guests their own unique look into the lives of the indigenous Sámi people in this untamed part of the world. Not only are your hosts extremely welcoming, but both the hotel rooms and cabin accommodations which are available are warm and cosy, and offer stunning views of this Arctic environment.